Hi Everyone! It's Jenny here, and I'm joining you today with a card I created using some of the wonderful crafty goodies from the Celebrate Friends collection. My card today showcases images from the WooHoo stamp set and co-ordinating dies. I love this set – it has so many stamps that you can interchange to build custom sentiments. 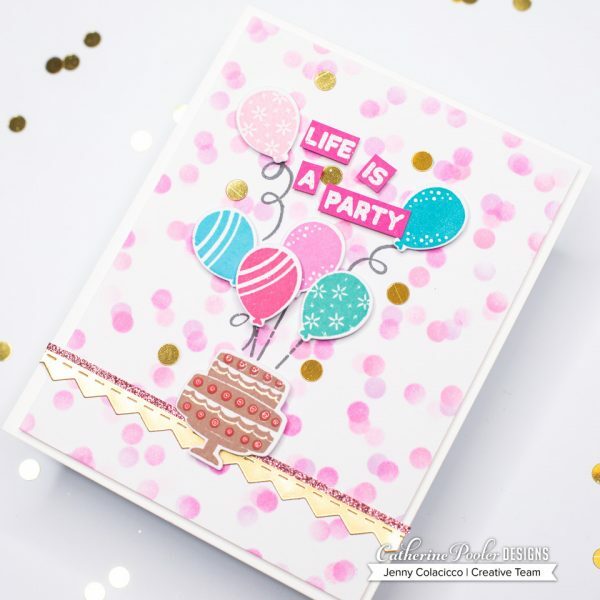 My card also uses the Scattered Circles stencil which is such a staple in my stash now – I'm going to show you how you can rotate it to create a different look on your backgrounds. To create my card, I adhered the stencil over Premium White cardstock panel trimmed to 4″ x 5 1/4″ and then, using an ink blending tool, I blended Sweet Sixteen ink over top, lightly in some places, and more heavy in others, to create a sort of ‘bokeh' effect. I then lifted the stencil up, rotated it 90 degrees, adhered it down and ink blended again, this time using It's A Girl ink. I rotated once again and ink blended Be Mine ink. Isn't it cool?!! LOVE THIS STENCIL!! I adhered the panel to a White card base using fun foam. 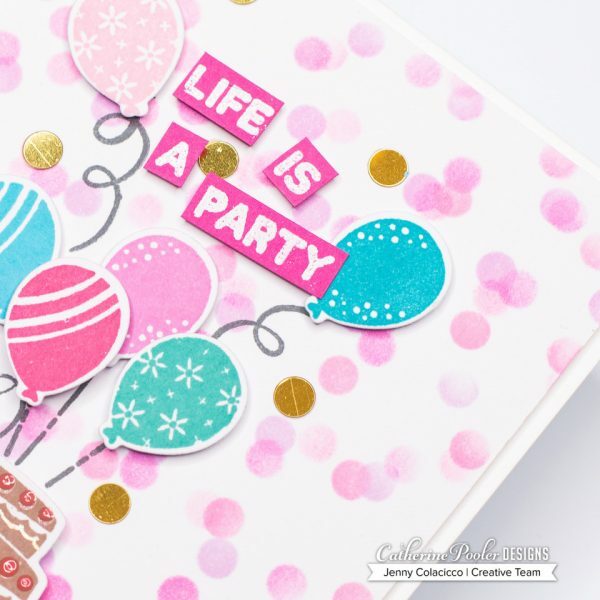 I stamped the cake and balloons images onto white cardstock using a variety of coordinating inks including those I used for the background as well as Aquatini, All That Jazz and It's a Boy, and die-cut them using the coordinating dies. I also added some gold edging to the cake with a gel pen. Before adhering down, I die cut the Morning Joe border from gold mirror cardstock and adhered to the panel, overlapping with a slim strip of pink glitter cardstock. I arranged the cake and balloons where I wanted them, and before adhering, stamped the balloon strings in Black Jack ink directly onto the background. I then adhered the balloons with foam tape (in some cases doubling up the layers for more dimension). The sentiment is also from the WooHoo set and was heat embossed in white embossing powder onto a scrap of hot pink cardstock, trimmed out and adhered with foam tape at jaunty angles. Gotta go jaunty for a celebration folks! To finish, I added some Nuvo drops on the cake in Carnation Pink for extra yumminess, and scattered some Gold Confetti sequins for a little more bling. They also tied in perfectly with the die cut gold border. 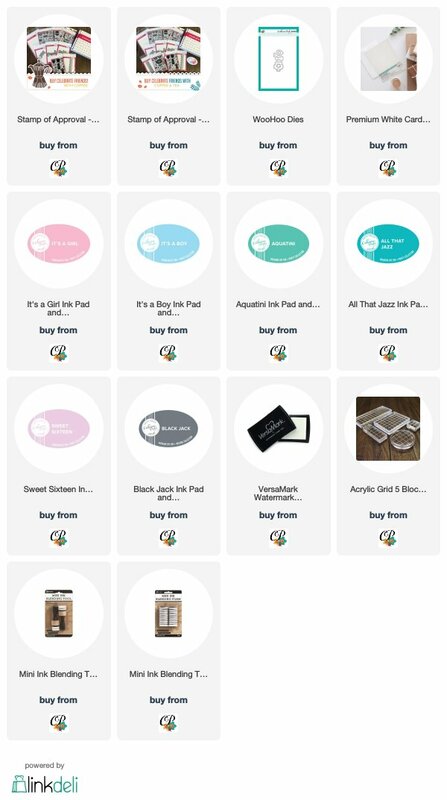 The Celebrate Friends Collection is almost sold out, don't miss this awesome box of goodies!